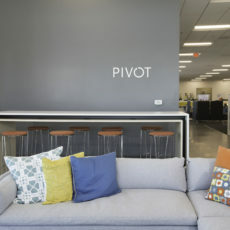 In 2015, Pivot’s Northern California warehouse facility and East Bay sales office moved into a brand new, state of the art building. 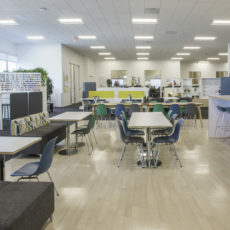 We converted our warehouse from three buildings in Milpitas of about 25,000 sq ft each, to a single space with over 100,000 sq ft. 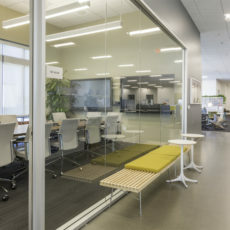 This conversion greatly improves efficiency and streamlines our processes by combining three operations, and the infrastructures needed to support each of the buildings, into one efficient space. 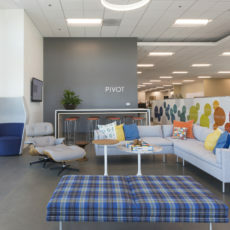 Pivot's East Bay location is unique in that it brings together the Service Operations department and the Sales department under one roof, facilitating natural collaboration and easy leveraging of resources. The teams often come together to eat lunch at the big family style table and activity center around the plaza. 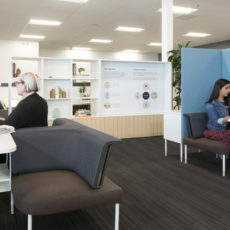 The workstations are Herman Miller Canvas office landscape in different configurations, including dock, beam, and wall-based. 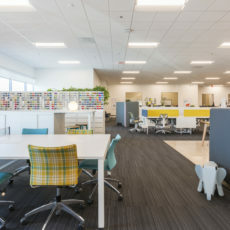 The showroom also features collaboration, meeting, breakout and lounge spaces with ancillary products from manufacturers including Stylex, Boss Design, Kielhauer, Naughtone, Rouillard, Watson, and Hightower. The warehouse showcases what we do with a giant picture window. 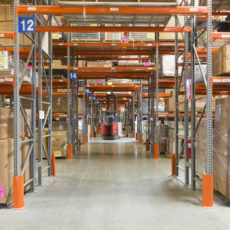 This building has state-of-the art racking, wire decking, lighting and equipment and is a wonderful destination for our customers, especially those interested in having Pivot manage their assets and store their product.